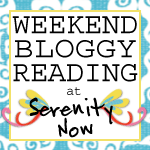 Serenity Now: Thrifty Treasures: Criminal Edition? Oh my gosh! What a horrible mess! I wonder what happened? But yay for your good finds! The picnic table is a great one! I've always wanted to get a picnic table like that and paint it a light yellow. Good for you! I am impressed that you dug around without being afraid. Free is always best. I love the picnic table. I've seen cute ones painted red, white and blue with a simple American flag design painted on the top. That would match the play house too. about the wicker, I wonder if you sprayed it with KILZ if that would not seal in the mildew and make it all useable? GREAT finds! I'm jealous. I want a picnic table like that, too! I think you could sand it down a bit and paint it neutral, or a light brown, or the yellow someone mentioned to brighten up the backyard! Ok, I thought the foreclosed house next door to me was awful, but you win the prize for ickiest abandoned house next door! Don't you wonder about people, how they can leave their home looking like that? I'm so glad you went over there and got some things that you could use, like the picnic table. That's going to be wonderful for your family! Hopefully a nice family will move in next door. Keep an eye on it, because they attract trouble when they sit empty. Believe me. OMGosh! How long has that all been there? Wow! That's awful. But ya know, I still think I'd have waded in for the wicker stuff...power washing, sun and bleach can go a long ways in wicker. I'm going to pick up a piece at my old office to bring home and clean up and get painted. Unfortunately, I don't have the room that I had in the shop space to do things! What a great picnic table. (Forgot to throw in my two cents). I've seen them with the top painted red and white checks like gingham and the benches solid colors. I have also seen them like the flag, but that bothers me. Apologies to all those that have picnic tables painted like flags. We've been searching for a picnic table too! I found a 6 foot one at lowes for $89.00 but I want an 8 footer. I plan to paint mine red whenever I find one. I can't believe that mess. That is insane. But hey good score for you! Oh.my.goodness! It makes me sad to see houses like that..."my T" and I were nosy one weekend and went to an open house down the street from us (the house had been repo'd by the bank), and apparently the owners had 16 CATS. And it smelled like it. There was so much pee on the walls that they had covered the walls in plexiglass to "make it easier to clean." Ugggggh. IMO, you did a good deed. How sad that all those things were left to rot. It broke my heart to see that wicker chair and hear it was covered with mold. What a waste. Enjoy the fruits of your labor and good luck with getting new neighbors. Popped in from SITS to say hi! Waste not, want not! Oh my! What a horrible way to treat a house!!! I hope it is all cleaned up soon so you don't have to deal with it anymore! Great picnic table though! Yuck! Save that wicker, girl, if it isn't too late--spray it down with bleach water, then rinse. Let it dry well, and repeat if necessary. Once you know it's completely dry, you can spray paint it. Might do that with the picnic table, too! Good finds, in spite of the yuck. Okay, I thought our neighbors' yard looked bad!! They're gone for 2 weeks and we have our house up for sale, so my hubby went over and cleaned up a little! :) You did find some great things! I love it when things are free! And hey...you were recycling!! 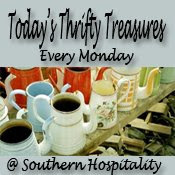 Enjoyed checking out your thrifty finds! 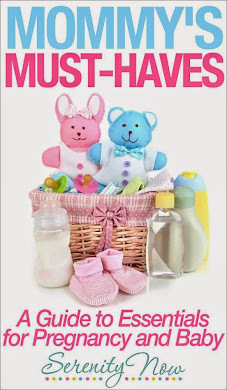 Great finds! Too bad about the house though. Here in California a lot of people trash their house when it is foreclosed. It's gotten to the point where the bank pays the homeowner a few thousand dollars not to leave it trashed. What a mess! You were brave to look through all of that junk, but it was certainly worth it because you found some great stuff. I still like a brick red color for a picnic table. We always had that color when I was a kid. A color that matches your siding and trim would also be nice. I think you have done a very good thing for your finds. And I bet you are really happy that you are going to have something done to the house next door. WOW!! Good heavens! I can't imagine living beside that. Thank goodness it will get cleaned up. I'd paint it blue. A slate blue. That just makes me sad! Personally, I would paint it a chocolate brown, but that is the color I am in love with right now. Your little scavenging trip reminded me the time you climbed the fence when you were like 9 months pregnant, got stuck and ripped your nightgown trying to steal a kitten from the neighbor's yard. P.S. I think you should powerwash the playhouse AND the table and then just stain the table a wood color. Wow, what a mess! That is unreal that it was left that way, but worst that you were living next to it! Looks like some good finds that will be great with a good cleaning or a fresh coat of paint. Wow, those pictures are certainly not for the faint of heart, but I really hope some wonderful new neighbors come your way. Great picnic table though. Wonderful find and free is a great deal. I would have waded over too. Unbelievable! I would love to find a free picnic table-definately worth the hassle. How disappointing! However, great way to make lemonade out of lemons! I'm friends with a looter! That's SO. COOL! I think you made out with some fabulous finds...sad that it was left that way. I'm hoping for some fab neighbors for you! What about good old barn red for the table? It's very classic, country, outdoorsy, and looks like it would probably match the red on the play house. Yuck! Yuck! Yuck! I can't believe people can live like that! Oh wait...before we (dh and I) moved back into my old family home we had to haul out something like two tons of trash- I'm talking stinky kitchen trash- that my siblings graciously left behind for us. In addition there were three unidentifiable cars...UGH! (but the floors, walls, etc were intact). The picnic table is a great find! I'd either stain it or paint it some bright fun color. I picked a barstool from a neighbor's trash last week and my 9year old was completely morified! I can't believe anyone would leave a home in that condition, but you scored some great finds! Hi. I found your link thru Southern Hospitality. I was shocked in what condition that how is/was. I'm happy that you have that picnic table another chance and a new life. I would probably paint it a fun and bright color. Poor thing! Wow! What a MESS! I hope they didn't have children living there! I just love reading your posts, you write so well and they always are so funny! Yikes, what a mess! Great finds though. I would looove to have some slate pieces! We need some for our yard, but will probably go with limestone because those slate ones are up to $10 a piece. Wow! What a fun adventure for you. You picked up some very nice things from that hideous mess. Nicely done :).